Pakistani authorities now believe a dangerous new militant group, out to avenge a deadly army assault on a mosque in Islamabad three years ago, has carried out several major bombings in the capital previously blamed on the Taliban. The emergence of the Ghazi Force was part of the outrage among many deeply religious Pakistani Muslims over the July 2007 attack by security forces against the Lal Masjid, or Red Mosque, a stronghold of Islamic militants. The fierce attack, in which scores of young, heavily armed religious students died, inspired a new generation of militants. These Pakistanis have turned against a government they felt has betrayed them and, to their dismay, backed the U.S. role in neighboring Afghanistan. The brief but bloody history of the Ghazi Force illustrates the unintended results of Pakistan’s policy of promoting Islamic extremists to fight India in the disputed area of Kashmir. That policy — which Pakistan denies it pursues — now threatens regional stability as the U.S. and Pakistan’s other Western partners pour billions of dollars into the country to stop the rise of Islamic militancy. The new group is made up of relatives of students who died in the Red Mosque assault. It is named after the students’ leader, Maulana Abdul Rashid Ghazi, who was also killed. The mosque’s religious school, or madrassa, had been a sanctuary for militants opposed to Pakistan’s support of the U.S.-run war in Afghanistan. Private television stations broadcast vivid scenes of the assault — commandos in black fatigues rapelling down ropes, the crackle of gunfire, bodies of black-shrouded girls carried out through the smoldering gates. Those images stunned the nation, especially families of the students and Pakistanis with deep religious feelings. “Before the Lal Masjid, militants hadn’t yet declared war on the state of Pakistan. That changed with Lal Masjid,” said Zahid Hussain, author and terrorism expert who has written extensively about Pakistan. Islamabad’s inspector general of police, Kalim Imam, told The Associated Press that the Ghazi Force was behind most of the deadliest attacks in the capital during the last three years. The attacks targeted the military, the Inter-Services Intelligence agency or ISI — which had ties to a number of militants — and a five-star hotel frequented by foreigners and the Pakistani elite. The Ghazi Force helped recruit a security official who blew himself up inside the office of the World Food Program last October, killing five people, according to Imam. The force also sent a suicide bomber in September 2007 into the mess hall of the commando unit that attacked the Red Mosque, killing 22 people, he said. Ghazi Force members may also have been involved in the audacious June 9 attack north of the capital that killed seven people and destroyed 60 vehicles ferrying supplies to NATO and U.S. soldiers next door in Afghanistan, Imam said. Many of those attacks had been attributed to the Pakistani Taliban, which operates in the remote tribal areas of the northwest along the border with Afghanistan. There is evidence of close ties between the Ghazi Force and the Pakistani Taliban, which the government has vowed to crush. The Ghazi Force is believed to be headquartered in the Orakzai region of the border area, where the leader of the Pakistan Taliban, Hakimullah Mehsud, held sway for years. The leader of the Ghazi Force is believed to be Maulana Niaz Raheem, a former student at the Red Mosque. Anger over the bloodshed at the mosque was all the greater because many of the militants and their supporters felt betrayed by a government that had once supported them. Both Ghazi and his brother Maulana Abdul Aziz Ghazi, who was freed on bail this year after two years in jail, were widely believed to have been on the payrolls of both the government and the ISI intelligence service. Their father, Maulana Mohammed Abdullah, enjoyed a close relationship with the late President Mohammad Zia ul-Haq, and the mosque was a center for recruiting volunteers to fight against the Soviets in Afghanistan in the 1980s. As opposition grew to Pakistan’s support of the U.S. role in Afghanistan, the mosque became a center of religious agitation against the government, with armed students taking over the complex and police laying siege. A former senior official in the Interior Ministry told The Associated Press that the police wanted to storm the mosque and end the siege at its outset, send the students home and shut down the religious school and a neighboring library until tempers cooled. 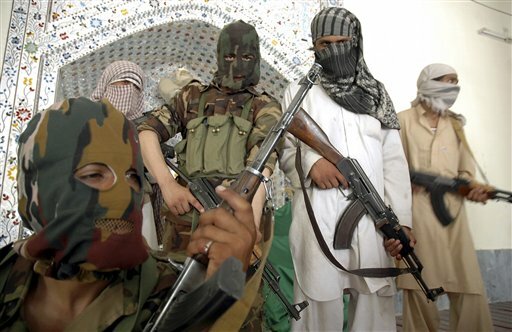 President Gen. Pervez Musharraf refused, the official said, even though police knew that members of al-Qaida’s affiliate organization Jaish-e-Mohammed, which is banned in Pakistan, were bringing in weapons for the students. Musharraf relented and ordered the assault after militants kidnapped several Chinese nationals running a massage parlor in Islamabad, accusing them of prostitution. The death toll remains in dispute. Red Mosque officials say hundreds died. The government says fewer than 100 were killed. In a rare interview, Abdul Aziz Ghazi told AP he warned the government that an assault on the mosque would unleash forces that no one could control. “I have been in jail. I did not form this force and I don’t condone the violence but they are angry at the injustices done,” he said this week. Although the assault turned many Islamic hard-liners against the government, Pakistan remains unwilling to break all ties to the militants, instead following a high-risk strategy of coddling “good militants” while fighting those deemed “bad militants,” analysts say. Army spokesman Maj. Gen. Athar Abbas denies any assistance to militant groups, saying past ties have long since been severed. He says the Ghazi Force is among the groups the 120,000 Pakistani soldiers waging war in the tribal regions are fighting. Yet Anatol Lieven, a terrorism expert with the Department of War Studies at London’s King College, said it’s clear that the ISI continues to protect some militant groups, even if it has broken with others. “A key objective of U.S. policy must be to alter Pakistan’s strategic calculus and end its support to militant groups,” the report said. Christine Fair, a co-author of that report and an assistant professor at Georgetown University’s Center for Peace and Security Studies, said the battle against extremists in Pakistan is mired in layers of subterfuge by Pakistani intelligence and a “mystifying” acceptance by the CIA of Pakistan’s “good-militant, bad-militant” policy. She said U.S. intelligence knows Pakistan protects one group — Lashkar-e-Taiba, which India blames for the 2008 Mumbai assault and Afghanistan accuses of masterminding deadly attacks against the Indian Embassy in Kabul.